Apple has released the first major iOS 6 update, iOS 6.1, for iPhone, iPad, iPod touch, and Apple TV devices. 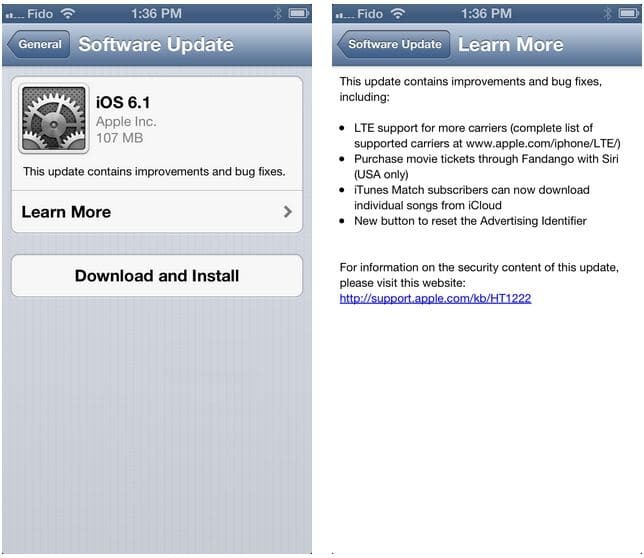 iOS 6.1 now makes the iPhone 5, iPad (3, mini, 4), to support 4G LTE from more carriers. 4G LTE on the iPhone 5 can now be used with 36 additional carriers, and 4G LTE iPads received support for 26 additional carriers as well. The update also added the option to buy movie tickets on Fandango using Siri, download individual songs from iCloud, the option to reset the Advertising Identifier. LTE support for more carriers (Apple previously announced that it would add more LTE carriers this week). 36 additional iPhone carriers. 23 additional iPad carriers. iOS 6.1 can be downloaded directly from your device using the over-the-air update feature by going to Settings > General > Software Update. If you want to do clean install, you can connect your device to iTunes and select restore or update. Additionally you can download the IPSW file for your device directly off Apple’s servers using the links below.